One of my favorite parts about going out to the movies is the popcorn. I've tried many different microwave popcorns over the years that claimed to be movie theater style and none of them have ever come close to the taste. Having tried Franklin's Gourmet Popcorn I think I now know why. I think none of them came close because they were made in the microwave, not in a popcorn machine which makes it true theater style. My husband and I got a popcorn machine as a gift for the family for Christmas last month and have had popcorn out of it several times now. It pops up a nice sized batch that's perfect for our family of four. And if not everyone wants popcorn I just put the leftover in a bowl with a lid to enjoy at a later time. It's popped with 100% coconut oil making it better for you than some other popcorns. It comes in an easy to pour pre-measured three-way pack, and allows you to decided just how much salt you want on the popcorn. 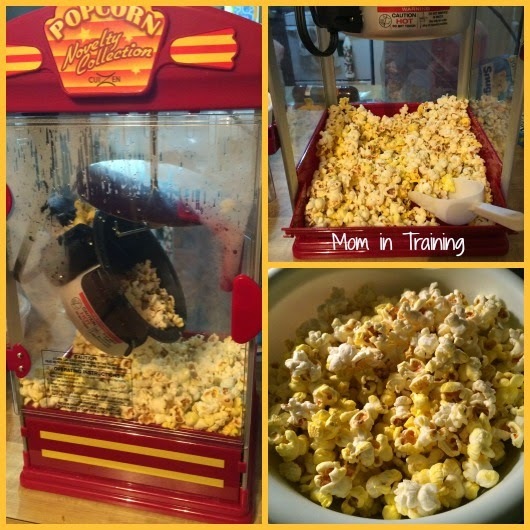 You can make the popcorn with kettle style popper (like the one above) or a stove top pot. Either way I'm sure you'll be happy with the results (and taste) of Franklin's Gourmet Popcorn. I love movie theater style popcorn too, nothing like it! I love that this is popped in coconut oil and you can add your salt yourself! YUM! I love popcorn! I also agree that eating popcorn is one of the best things about going to the theater! I have not tried this brand of popcorn yet. I really wish I could afford a popcorn machine, but then I would likely eat way too much!! LOL Thanks for the review! My grandpa used to make popcorn in a popper like that. It was really good. I'll have to look for this brand to try.